The basic functionality of a good drill is something that many would be lost without. While you can substitute some tools, there really is no alternative to top quality, selection of Rotary drills. As you can see from the selection on our site, we offer only the very best quality drills for your use, ensuring that these products will never let you down, when you really need them. Rotary drills have many uses and are the perfect partner when it comes to putting up wall hangings or drilling through lintels. They usually offer multiple speeds, giving you the option to start on a low speed and ensuring exactly the right start position, before switching to full speed and finishing the job with ease. These drills come in both corded and cordless versions, both of which have advantages for differing types of work. Longer jobs in a stable, static location would benefit from a corded drill, as it provides a constant, uninterrupted speed that doesn’t dissipate. Cordless ROTARY drills are perfect for mobile locations, where an electric outlet doesn’t exist, or when the target is in an awkward position. 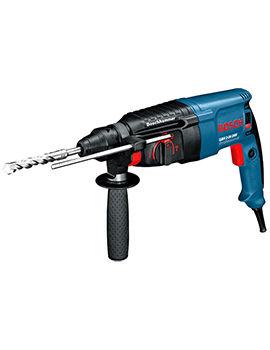 Many Rotary drills feature a hammer drill option. This is ideal for masonry and outdoor work, providing a hammer-type action to gently force its way through harder surfaces. To remove the drill bit will sometimes require a specially designed key, provided with the drill. Some models, however, are keyless, providing a quick change for the drill bit, with less hassle. If Rotary drills are a little too full-on for the job in hand, we also offer a range of robust, sturdy screwdrivers. Bought either individually or in sets, the humble screwdriver comes in handy on a multitude of occasions and is really something that you just can’t be without. A decent set of screwdrivers will never let you down, and with all standard sizes covered, they will often prove a DIY lifeline. Our screwdrivers are made of the highest quality materials and are guaranteed never to bend or break when used. We provide both slot and cross head screwdrivers and all our multi sets come in a secure, mobile casing. You may also want to consider purchasing a screwdriver set that features magnetic tips. This comes in particularly handy when working with small screws, as it will gently hold the item in place while you find the correct position to feed it into the thread.